Detroit mother Vanessa Raices, 42, said she doesn’t know the ins and outs of what is happening with health care in Washington, D.C., but she knows enough to be worried. Health care for Raices and one of her four children is covered under Michigan’s Medicaid program. That coverage could change dramatically under the GOP health plan under debate by Congress. The GOP’s American Health Care Plan, also known as the Ryan House Plan, would reduce Medicaid funding by about 25 percent by 2020, according to a recent analysis by the nonpartisan Congressional Budget Office. About 14 million people would lose Medicaid coverage over the next decade, according to the report. The program has deep roots in Michigan, where Medicaid provides health coverage for nearly 2.5 million people. The proposed changes would touch every community in the state, from urban centers in the southeast to the rural counties of northern lower Michigan and the Upper Peninsula. “This financial strain on our state budget will likely force lawmakers to make difficult decisions by changing Medicaid eligibility and coverage or cutting other vital state programs including education, public safety or infrastructure,” said Gilda Jacobs, president and CEO of the Michigan League for Public Policy. Medicaid funding is used to cover a broad swath of services such as autism treatment and transportation for the disabled and ranging from school-based health clinics to home care for the elderly. It pays for mental health and substance abuse treatment, and about 70 percent of nursing home residents in Michigan depend on Medicaid to pay for their care, according to the Health Care Association of Michigan. 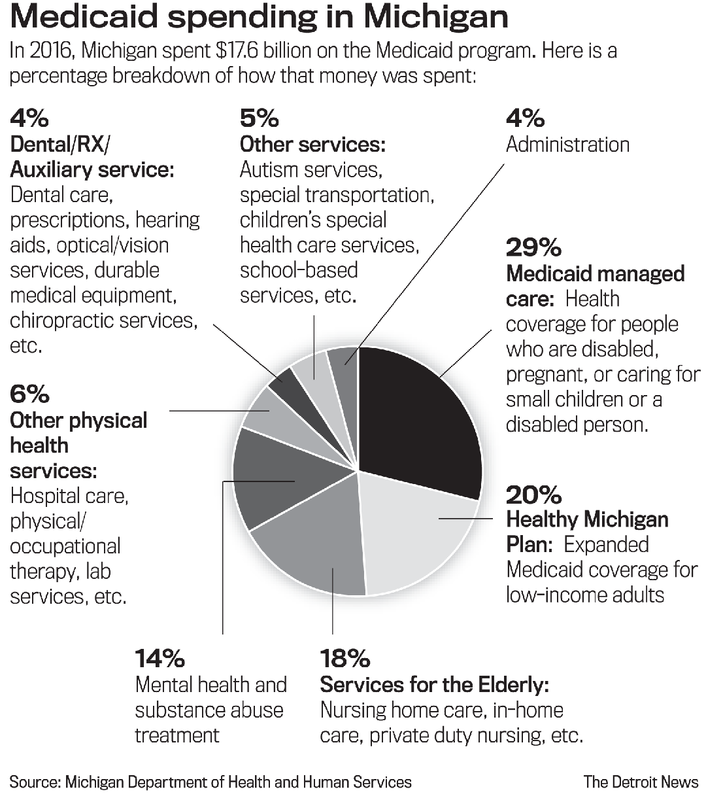 Michigan’s Medicaid expenditures topped $17.6 billion in fiscal 2016, with roughly $13 billion paid by the federal government, and $5 billion by the state. Under the proposed GOP changes, states would pay a larger share in return for more control over their Medicaid programs. Supporters of the Republican proposal say the current Medicaid model is unsustainable and, if given the authority, states will find innovative ways to manage their programs. The plan is opposed by major health industry groups, including the American Medical Association, AARP, insurance industry groups and health advocates, that believe millions of Americans will lose health coverage. The GOP plan would cut funding in part by placing a cap on enrollment. Currently, the federal government matches whatever amount states decide to contribute to their Medicaid programs, with no limit on the number enrolled. The Republican plan would switch to a per capita funding system based on the number of people each state has enrolled by 2020. The amount paid for each enrollee would increase if the health care component of the Consumer Price Index goes up. States would get a set amount, with fewer regulations to govern how they spend it. States would have more control over the shape of their programs, but would have a funding gap to fill — $532.6 million in fiscal 2020, according to a Michigan Senate Fiscal Agency analysis. “The federal government is coming to the states and saying, ‘Hey, we’re going to give you a big pile of money and all kinds of freedom to run Medicaid,’ ” Dennis Paradis, executive director of the Michigan Health Policy Forum, said of the Republican proposal. Michigan has 1.75 million enrolled in its standard Medicaid program, which covers people who are disabled, pregnant moms and individuals caring for small children or a disabled person. The federal government matches the amount states contribute to the program. With expanded Medicaid, Michigan was able to enroll an additional 650,000 residents in its Healthy Michigan Plan, affecting people with incomes at or below 138 percent of a federal poverty level (about $16,000 a year). The Republican health plan would terminate the enhanced federal matching rate for new enrollees in the Healthy Michigan Plan in 2020. That move would result in a larger financial commitment from the state than anticipated when Republican lawmakers approved the Healthy Michigan Plan in 2013. At that time, Gov. Rick Snyder was among GOP governors who broke party lines to support Medicaid expansion in their states. He was able to push the plan through Michigan’s Republican-dominated Legislature, at least in part, because it is funded mostly by the federal government. Under the Affordable Care Act, the federal government would pay 100 percent of the program’s costs to 2017. States would then begin making small contributions to the program, which were to be capped at 10 percent in 2020. John R. Graham, a senior fellow at the National Center for Policy Analysis, a free-market think tank, is among conservatives who believe the way Medicaid currently is structured results in continually escalating health care costs. He thinks Republicans are on the right track. Raices gets monthly checkups at the Western Wayne Family Health Center in Inkster. She suffers from rheumatoid arthritis and fibromyalgia, and has two bulging discs in her spine and painful problems with both knees. “I come here every month faithfully and they take good care of me,” Raices said during a recent visit. The Western Wayne center is one of Michigan’s 43 federally qualified health centers that provide free or low-cost primary health care and dental services for nearly 642,000 Michigan residents. The center’s case load increased substantially after the Healthy Michigan Plan took effect, said Linda Atkins, CEO of Western Wayne Family Health Centers, which also has clinics in Taylor and Lincoln Park. Adding to the uncertainty as debate on the Republican proposed changes continues, the federally qualified health centers receive funding from an annual appropriation by Congress that is up for renewal in September. “In the scope of everything that’s going on, we could stand to lose 70 percent of our funding,” Atkins said. Jen Anderson, a spokeswoman for the Michigan Primary Care Association, said that without the appropriation the 2,800 federally qualified health centers could close nationwide, costing 51,000 health care jobs and restricting health care access for 9 million Americans. “In Michigan, that translates to a loss of $64,673,313 and 63,418 patients losing access to care,” Anderson said. Bishop Walter Starghill Jr., head pastor at Face to Face International Outreach Ministries in Inkster, said he learned he had diabetes after he enrolled in Healthy Michigan and went to the Western Wayne Family Health Center for a checkup. He had ignored his health for years, he said, but now gets regular medical care and takes care of his health. Health coverage for people who are disabled, pregnant, or caring for small children or a disabled person. Nursing home care, in-home care, private duty nursing, etc. Dental care, prescriptions, hearing aids, optical/vision services, durable medical equipment, chiropractic services, etc. Autism services, special transportation, children’s special health care services, school-based services, etc.